Gary is a full time employee at Central Metals. 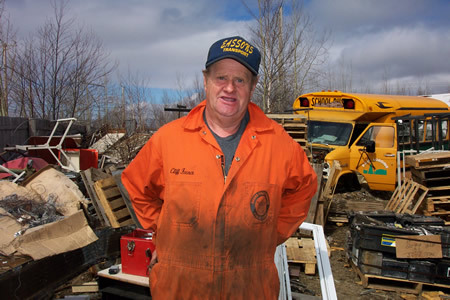 Gary is responsible for assisting the mechanics, removing parts off scrap vehicles, as well as helping out in the yard, and any other duties assigned to him. Gary works along very well with the staff at Central Metals, and he is very proud to have this position. He is a great help to all of the staff and is always willing to try new things and help out whenever he can. Matt has been employed by Sobey,s since 1999. 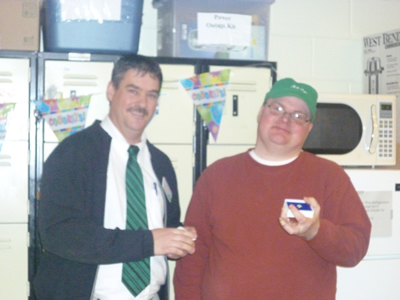 Mat recently received his 10 year service pin by Sobey's Manger Bill Gillingham.. Matt thoroughly enjoys his job at Sobey's and looks forward to going to work each day. Matt works with a Job Coach and is responsible for stocking eggs, milk, cheese and 2 litre pop every shift. When these duties are completed Matt also tidies up the aisles and stocks any other products that are ready to go out on the shelves. Matt keeps very busy on the job and is a very energetic worker. He thoroughly enjoys his job and enjoys working with his Job Coach, who can usually be found laughing at Matt's funny stories while they work. Matt gets along well with all of the staff at Sobey's who are very supportive of Matt and are always available to help him out in any way. Paul has been an employee of Botwood Foodland since 2000. Paul was initially responsible for straightening shelves in the store. He now works in the produce department as well. He is responsible for bagging vegetables and fruit and keeping the produce section organized and tidy. Paul is very good at his job. The customers are very familiar with Paul and always tell him that he is doing a good job. Paul's employer and co-workers say that Paul is a pleasure to work with and he has come a long way since he began working in 2000. You can always find Paul working away with a smile on his face. 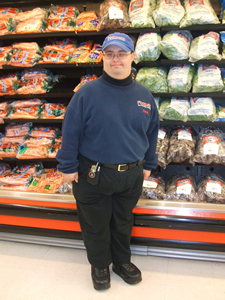 Paul says that he loves working at Botwood Foodland and that he enjoys seeing people that he knows in the store.